I’ve never considered myself a sucker for teen shows. I’ve always felt too mature to watch them, often rolling my eyes and snickering at overused romantic tropes and the different dystopian lands the too good to be true, model-esque characters find themselves in. Given that, I am sucker for heart and originality. So, when I see these qualities in TV show characters, I tend to latch on in awe and respect. I experienced this while growing up watching Degrassi, and even found myself binge watching the new Netflix spin-off in a day. Recently, I’ve found this admiration for Shadowhunters, a Freeform show about “teenagers” (they’re definitely not actual teenagers, but I guess the audience just chooses to collectively ignore that glaring fact) who run around and fight demons for a literal living. The Shadowhunters world is split between two classes of people, the “Shadowhunters” who are angelic soliders whom are meant to fight the “Downworlders”, or supernatural beings like warlocks and werewolves. This class distinction is meant to be an allegory for the real-life hegemony of various races and ethnicities. I learned about this show on accident and thank God for that because it introduced me to probably one of my favorite television show characters of all time: Magnus Bane, the immortal and centuries old, self-proclaimed “free-wheeling bisexual”, and High Warlock of Brooklyn. I will say that the show itself is a bit outrageous; after all, it appeals to a teen demographic. Further, this outrageousness weaves its way through the characters’ personas as well. Proof of this struck me the first time I sat down and saw an episode of Shadowhunters, as Magnus Bane was wearing makeup: dark, glittering, obvious makeup. He was dressed like something out of a Liberace fever dream in the best way possible; he was wearing beautiful, ornate jewelry. His hair was perfectly coiffed, tall, majestic, and so utterly artful. And I absolutely loved that visual, because it was nothing like I had ever seen before on TV. Additionally, Magnus is Asian, Indonesian specifically, and very open about his sexuality and sexual desire, something audiences don’t often see of Asian men in Western media. Often, Asian men play as the comic relief (see Long Duk Dong in Sixteen Candles), by the exploitation of their cultures and are not shown to have sexual desire or agency. They are often stereotypes, whether they’re depicted as I.T. or doctors, and also, they’re never seen as explicitly wanted. But Magnus Bane, played by actor Harry Shum Jr., is far from that image. He is wanted, by one of the show’s main protagonists no less, Alec Lightwood. The audience sees sexual desire and agency, not only on Magnus’s end for Alec, but vice-a-versa too, and Magnus has agency beyond his ties to Alec in the show. He’s given multiple story lines throughout the first season that have proved to be captivating and heartfelt; he has a developing character arc as a man who is battling inner demons but strives to protect his kind and those he cares about, he has friends in high places, and the audience gets many glimpses into his world. He is, in fact, well-rounded and a character in his own right. This is a foreign concept for Asian men in modern TV, yet this character and characters like Josh Chan in the CW’s Crazy Ex-Girlfriend are steps towards breaking age-old stereotypes, hopefully. Moreover, throughout the course of the first season, the audience is reminded time and again of Magnus’s power as a warlock. He is immortal and has been alive since “the Dead Sea was just a lake that was feeling a little poorly”, he reminds another warlock in “Raising Hell (1.04)”. But what’s interesting is that he’s not characterized as powerful because he’s a man or a warlock, but instead because of who he is as a person; kind, if not a bit capricious, sensible, intelligent, sometimes vulnerable although he hides it well, and loyal. He is powerful but not inherently because of his title or skill-set, but because of his nature as a person and that is something game-changing when it comes to a male character and especially one that wields huge influence over the people in his life. We, as the audience, see many examples this. In “Raising Hell (1.04)”, the main protagonists race to him for help to save a friend, werewolf and fellow “Downworlder” Luke Garroway, because they know of his strength, and towards the end of the episode he does in fact save Luke’s life. But there isn’t a moment where he reminds them of his strength or his power, he just acts through compassion and a willingness to understand their situation. He becomes invested in their lives because of his concern for others and empathizes with their demons, both literal and metaphorical. So instead of using his power to remind them that he’s masculine, he uses his power to help them in kind. And again, it’s not his power that defines him, but his nature. Further, he never once identifies as masculine, instead he carries himself as he pleases, wearing makeup, jewelry, flashy, detailed clothing, showing carefully landscaped stubble on his face. He’s verbose and cocky, vulnerable yet at times masked and threatening, very open about his desires in people, passionate about who he is and what he stands for, empathetic, sympathetic, and charming. It’s safe to say that Magnus Bane is rather complicated and cannot be defined by standards of normative or “hegemonic masculinity”. Alec: Magnus, you have to know that family means everything to me. Magnus: I get it-you’re part of a ‘don’t ask, don’t tell’ culture. I’m fine with it. You’re a traditional guy. Alec: I am. And that’s why I proposed to Lydia. 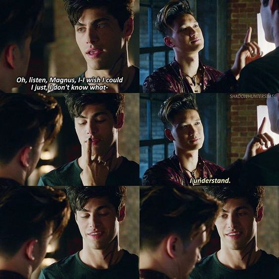 Alec: It makes sense. It’s a solid partnership, for both of us. Magnus: Solid partnership. That’s hot. Alec’s persona as a man is ingrained in the standard of “hegemonic masculinity” as he’s shown to be dominant and emotionally closed off, characteristics that are no doubt encouraged in the “Shadowhunter” culture he was raised in. But Magnus is self-aware of the boxes that society puts men into, and he’s also very self-aware of the fact that he doesn’t fit into any of them. He identifies as a man, yes, and masculine, perhaps, but not because of his power as a warlock, or dominance as a warlock and man with influence, or the violence he is capable of, but by what he wants to feel and look like. Magnus Bane is not here for your normative foolishness. Maryse: You’ve embarrassed all of us. Alec: Why, because he’s a guy? Maryse: The fact that he’s “a guy”, as you say, is the least of my worries. Alec: Then what’s the problem? Maryse: That you chose Magnus Bane. Robert: His reputation precedes him. Even for a warlock, he’s a bit of a lothario. People know of Magnus and his experience, they know of his sexual interests and desires, thus they label him as a deviant, or someone who is an ill-advised option for someone of Alec’s class and race. 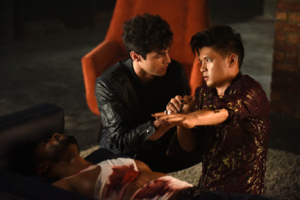 According to cultural anthropologist Gayle Rubin’s “charmed circle of sexual behaviors”, Magnus is not culturally accepted because he does not fit within the preferred hierarchy of sexual behaviors. He is not heterosexual and not in a committed relationship despite being centuries old. He has had multiple romantic partners during his life; he’s a warlock and a “Downworlder” so the preferred people in the “Shadowhunter” society already alienate him due to explicitly racist and classist motives. Magnus is seen as promiscuous and unable to commit, almost untouchable, as many societal deviants and bisexuals are portrayed in popular media. But the audience is privy to his true nature. He is bisexual, yes, and he is open and unafraid to act on his feelings, but he does not take advantage of Alec at any point. He is instead careful to touch him at all, sympathetic to his problems, and understands his struggles with being closeted. Also, despite having multiple partners, he is not promiscuous or confused; after encountering his ex-girlfriend Camille in “Morningstar (1.13)” after kissing Alec, she taunts him about his naivety when it comes to true love and even kisses him in front of Alec to try and complicate things. But he rejects her, telling her that “people are more than just toys for your amusement”, and makes sure Alec knows that the kiss was unwanted, and that his interest is in Alec. He is confident about who he is and he is unashamed, but he is not villainous as many bisexuals in western media are portrayed. His bisexuality is not duplicitous or a sign of deviance, but just a part of who he is, yet it does not define him and the audience can clearly recognize that. *This was a blog post written for the likes of Bitchflicks. It is longer for their standards, however the length accommodates certain grading requirements. 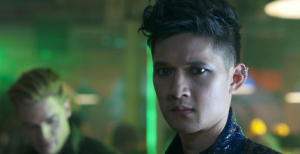 *This blog post analyzes the characterization of Magnus bane strictly in season 1 of Shadowhunters. © 2017 Changing the Landscape. All images are copyrighted by their respective authors.